When I say “fiber,” you say “pancakes.” Fiber! If you’re still reading, I’m digitally high-fiving you. Because I totally get it. No one under the age of 107 is going to champion fiber in their diet. Unlike the healthy cool kids (looking at you, zucchini noodles), fiber-rich foods aren’t exactly a trend. But in the spirit of the New Year, I was determined to pump up my favorite indulgent breakfast item with a few healthy additions. And that’s why this sweet stack is chock-full of oats and raspberries, one of the highest fiber fruits alongside the good ol’ trusty prune. 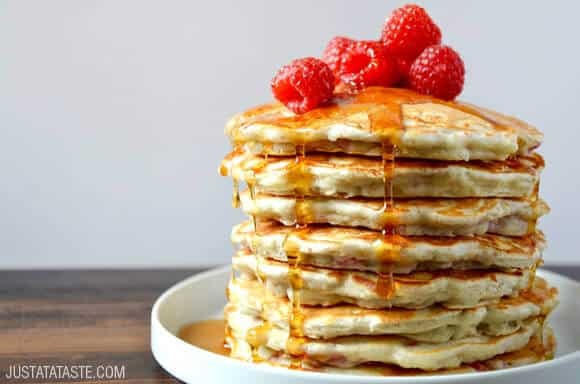 So now you can indulge in a tall stack of oatmeal pancakes with way more fiber and way less guilt. 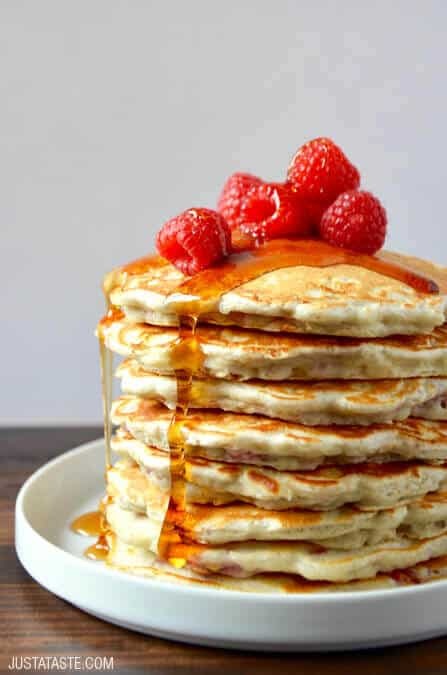 And for all those who could care less about fiber and have still politely read to this point, head on over to my recipe for Light and Fluffy Buttermilk Pancakes for a classic rendition begging for chocolate chips, sprinkles and countless other festive mix-ins. It’s a win-win! 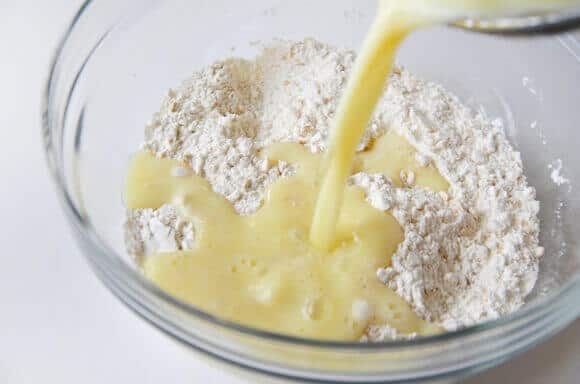 In a medium bowl, whisk together the flour, oats, baking powder, sugar and salt. Place a nonstick pan or griddle over medium-low heat. Grease it with oil (optional). Drop about 1/4 cup of the batter onto the hot pan, spacing the pancakes at least 2 inches apart. 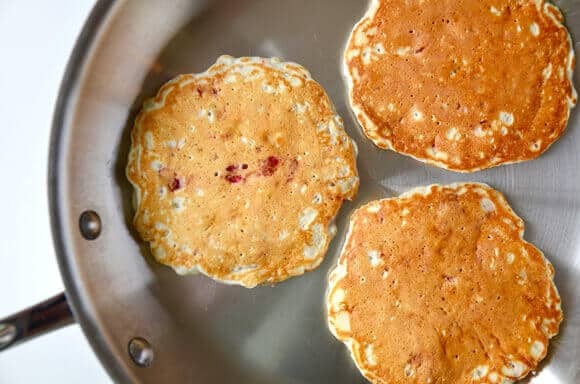 Once bubbles form, flip the pancakes once and continue cooking 1 to 2 more minutes until the pancakes are cooked throughout. 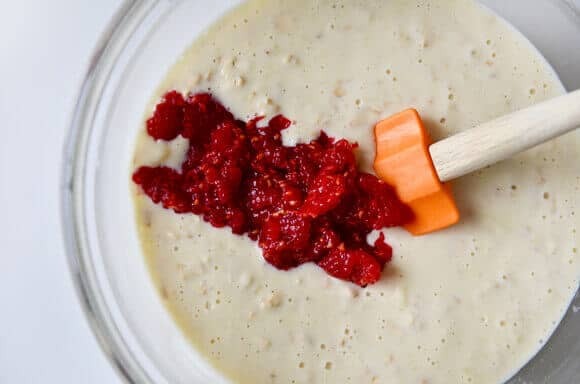 Serve the pancakes with maple syrup and additional raspberries.